“My daughter is 15 months old and was born premature at 31 weeks.” (So, I’m going to consider her about 13 months.) “We’ve had some problems getting her to sleep at night since she was born. She still wakes up several times during the night and when she wakes up crying, I give her a bottle and once she’s done, I lay her back in her crib to fall asleep. I first put her down at 7:30p.m. This is after her set bedtime routine of bath, bottle and brush teeth. Once asleep, she will sleep until 12:30a.m. which is then followed up by her waking up every few hours until she’s up for the day at 6:30 a.m. When she’s home, she takes a two-hour nap around 9 and then a 45-minute nap around 3. I’m not sure what she does when she’s at daycare. They have said she takes a long morning nap and sometimes takes an afternoon nap. Is Reflux or GURD a Factor of Your Toddler Sleep Problem? There are a lot of things going on here. I will answer this question considering her as a 13 month old since she was born 9 weeks early. I’m not sure if you are still adjusting her age or whether there are any medical or developmental problems which can factor in to what’s happening now. I recommend that you rule out reflux. If she has a history of reflux, find out whether it’s still a problem. I noticed that after you feed her in the middle of the night, she then wakes up frequently. I don’t know whether she’s waking up frequently because it becomes harder and harder to go back to sleep — which is common. It could also be because she had a bottle and then you lay her down and she has reflux. You didn’t share any of this history but these are potentially important points to look at . You also mentioned that your daughter is in daycare some days, while she is with you the other days. At daycare she takes a big morning nap and a small afternoon nap (sometimes) and the afternoon nap is at 3 o’clock to 3:45. That’s a big window from approximately 11am to 3pm. I’d rather see a shorter morning nap and a bigger afternoon nap so that she’s not conking out at bedtime and that can help potentially reduce the night waking. You may want to also wake her after one and a half hours from the morning nap to ensure she has an afternoon nap. And if even an hour and a half morning nap causes her to not nap in the afternoon at daycare, I would ask them to shorten it to 45 minutes so she can have a bigger afternoon nap. I would also encourage you to get more details from your daycare provider such as how they put her to sleep. Is there any flexibility in the timing of the naps, and are there any ways to promote her having better day naps? If you are logging her sleep you may see a pattern where she sleeps worse at night and wakes more often after the 12:30am bottle after a day of poor naps. Make sure you continue to put her down to sleep at bedtime awake and that you are not doing anything else to help her go back to sleep. She would then expect that help in the middle of the night. This is CRITICAL for sleep coaching success! Ask your pediatrician about whether you should wean the bottle. If so, reduce the number of ounces within a week or so. Read this article about sleep coaching siblings who are sharing a room. I know that was a lot! All the details are in my book “Good Night, Sleep Tight“. Hello, my 15 month old is not sleeping through the night. He has never wanted a bottle, nor a pacifier, and doesn’t seem to be too interested in whole milk. Some time after he started eating solid foods,I have limited breastfeeding to morning right after waking at around 630, afternoon for a nap after lunch at about 1230, and for bed time after dinner at 2000. He is usually up within an hour crying, then after another two, and while teething, it seems like every couple of hours until he is up for the day. I am exhausted from having to get up so many times a night, and don’t think it is healthy for him either. Sometimes I hold him and sway from side to side so he can fall asleep, and some other times he just crawls on my chest where he goes to sleep laying on me. His toddler bed converted crib is pushed up against the bed where I sleep. When I moved back into the master bedroom with the baby, I put our 3 and a half year old son in there as well. He weaned himself of at 9 months but used both the pacifier and bottle. I don’t know how to make my almost 16 month old fall asleep on his own either. I have tried the crying and not picking him up but he turned out to be teething and I just felt so bad that I don’t do that again. Your advice will be greatly appreciated, thank you. Marcela L That sounds frustrating, Marcela! Have you tried sleep coaching? I would recommend using something like http://sleeplady.com/babysleepsolutions/ to help get his sleep back on track. Teething can definitely cause sleep issues, but it sounds like he needs to learn how to sleep, and http://sleeplady.com/babysleepsolutions/ can help you do that gently and effectively. Good luck! 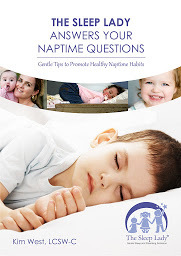 Enter your email address below to receive "The Sleep Lady's Answers to Your Naptime Questions"... it's 100% FREE! 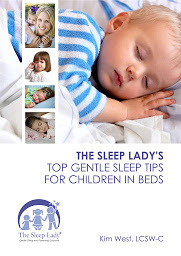 Enter your email address below to receive The Sleep Lady's Top Gentle Sleep Tips to Help Your Child Learn Positive and Lasting Sleep Habits ... it's 100% FREE!